erbrich instrumente GmbH has been producing and selling surgical instruments for all disciplines as well as instruments for veterinary medicine since 1964. 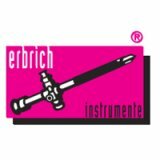 Due to their outstanding quality, erbrich instruments have an excellent reputation worldwide. In addition to quality, innovation, reliability and the complete program are reasons that make erbrich instrumente an important partner in medical technology.